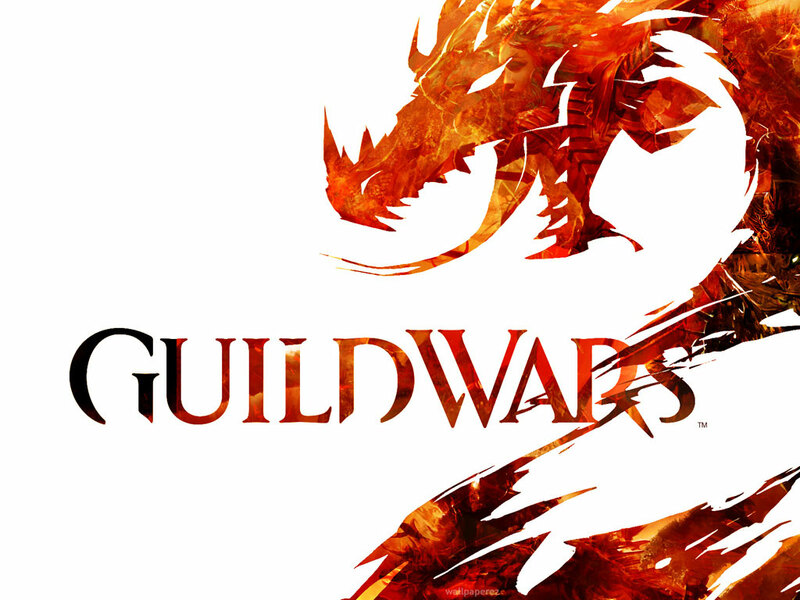 I've been trying to decide when to make this post, and given that Guild Wars 2 just announced it will go on sale on April 10th, along with sales model and system speces, I figured now was a good time. So I've been really excited about Guild Wars 2 for a while now. Basically ever since I started seeing the live demos they were putting on at various trade shows last year. As it gets closer to release (2012 release was confirmed in January, plus I mean, it goes on sale in a month) things just get more exciting. A few weeks ago the press had access to a weekend beta event and the reports seemed to be glowing from all sources. I fully intend to give the game a major whirl, and you should to! DO IT. Now I'm not a big PvP guy by any stretch. I mean I enjoy it from time to time, but it usually just annoys me. 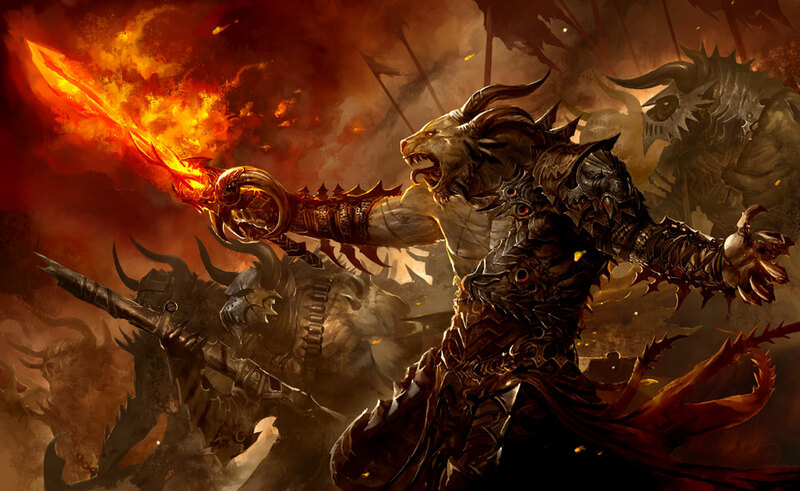 Guild Wars 2 has me interested though. 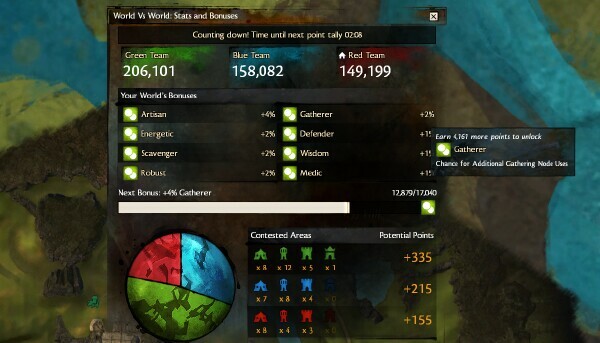 If you were not aware, Guild Wars 1 was a big time PvP game (which was why I stopped playing, really) and Arena net did a great job of keeping the game somewhat balanced. Keep in mind that there were over 1000 abilities and essentially 100 different classes. They also offered pvp tournaments where the most successful teams could qualify to attend live tournaments and play for as much as $100 000. Thats all GW1 though. GW2 takes a bit of a different approach. There is the battleground style pvp, but what interests me personally is their World vs World vs World. Basically they have a giant map where three servers will fight eachother over control of various keeps, camps and towers. The map is set up so that even a single person in the right place can make a difference, but group play is still huge. It's all about bashing down keep doors, cutting off supply lines so your opponents can't get siege weapons, etc. Like I said, it's also a 3-way battle. These fights go on for 2 whole weeks, and then you move on to face new servers. This uses a matchmaking system similar to several other games that will try and set your server up against a server with a similar win rate. It's hard to encompass what's so intriguing about WvWvW in so few words, but it has me very interested. This is one that I could probably group together with a future category, but I also feel like it's significant enough to have it's own. I don't think I've seen an MMO that has ever encouraged and rewarded exploration as much as GW2. It seems a lot like a "sandbox" MMO in that regard. Everywhere you go there is something interesting and engaging going on. I heard one person say they were just running around a town exploring when they entered a tavern. He heard some raised voices and a bar fight started. A quest had basically just thrown itself at him purely because he had walked into that bar. That's certainly not the extent of it though. Everywhere you go there is stuff to find and stuff to do, usually with some sort of reward attached to it. Maybe you dive into a pond and realize there is an entire underwater castle to explore down there. Maybe you wander off into the woods and find yourself on the edge of a mountain that is actually a jumping puzzle. Maybe you are just wandering down the road to your next objective and you notice a house being attacked by thugs. Like I said, some of this bleeds into a future category, but the point is you are encouraged and rewarded for exploring, more than any other MMO I can think of. I'll admit this is a bit of an odd one, but from what I have seen it's certainly one worth mentioning. Of course polish comes in a wide range of forms and is kind of hard to quantify, but Guild Wars 2 has it. Everything looks amazing graphically, and despite having a full action combat system where you are not only expected, but essentially required to use your abilities on the move, very little of what I have seen has had any graphical glitches of any kind. That's not even scratching the surface though. It just seems to me that everything Arena net has put into this game has been incredibly well thought out and implemented. For instance; know those annoying server queues? Guild Wars 2 doesn't have them. If you log into your server and it's full, you go onto an overflow server. There you can do almost everything (except World v World, and interacting directly with the players from your actual server. You can even use your normal guild chat still) and it all stays with you. You can spend your 20 minutes waiting by actually playing the game. And if you find yourself in the middle of an event when your queue pops, you may well choose to stick around until that event is done. That's just one thing though. GW2 is a game full of well thought out elements. I wanted to make this my number one, and I have alluded to it a few times already, but alas, we all know what #1 is. At any rate, #2 is Dynamic Questing. It's kind of hard to explain in short what that means, but basically just take your normal concept of what questing in MMOs is and throw it out the window. 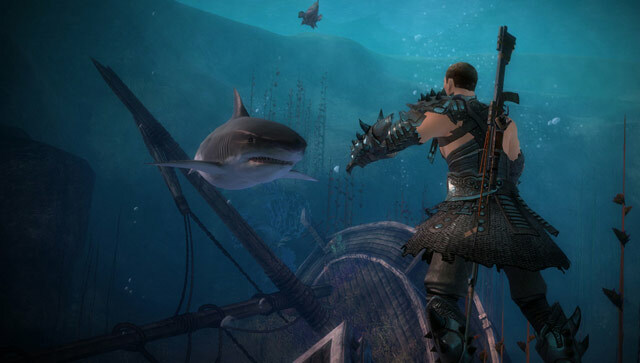 In Guild Wars 2 there are (to my knowledge) three different kinds of questing. The first is your personal story quest. Admittedly with these, they do stick more or less to the normal questing conventions so that they can craft a more guided experience. Second is Renown quests. 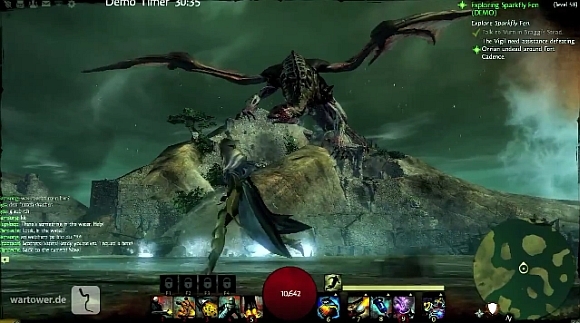 These are GW2's take on the average kill x of y quests, but I'll get into that in a moment. Finally you have full on dynamic events. Story quests speak for themselves, so let's jump right into Renown "hearts". Basically when you arrive in a new zone you talk to a scout, and he tells you who in the zone needs help, which places a bunch of little hearts on your map. You go to these people and help them. How you help them varies. Each person can be helped in a variety of ways, and is a group effort. So if you need to help a farmer you can do so by say, retrieving stolen crops, chasing off bandits, putting out fires etc. The idea is there is no single thing you need to do, but they all contribute to the same goal. Plus like I said, if 4 people are all doing the same "quest", they all contribute to the same goal so it's a communal effort. Completing renown hearts earns you karma, which is kind of like reputation. This is something Arena net is trying to push hard in Guild Wars 2: A world where everyone wants to help the people they see, and are rewarded for it without actually needing to group up. Finally there are dynamic quests. These are kind of hard to wrap your head around how exactly they work, but the exact mechanics aren't really important. 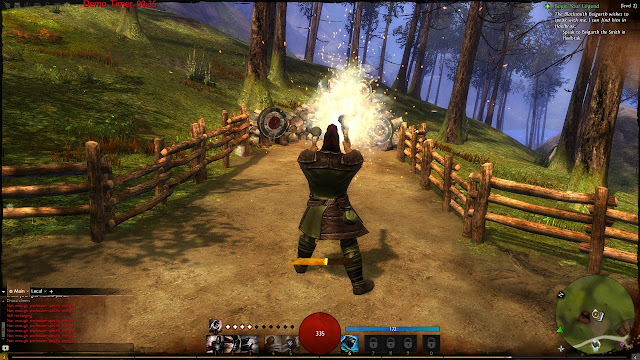 If you have played Rift, imagine dynamic events as being Rifts done right, with a little bit of Warhammer Online in there. basically there will be periodic events that pop up that proceed along a sliding scale. So there might be a bunch of centaurs attacking a trading post. You have to work together with the rest of the zone to fight them off (or, if you are alone the event scales down to be soloable). If you fail, that post is lost, and maybe you then get some quests to help recover from that loss. The next dynamic event might be that the centaurs are moving on to another place. Or maybe the next event is you are trying to take back that trading post. Basically each zone has it's own current state that is decided primarily on the success and contribution of the people who are in that zone. As a result the questing experience is going to be different every single time you see a zone. All in all the goal is to have quests that feel like you are just wandering the world doing whatever you want to do, and less chasing exclamation points. Since they don't fit anywhere else I should also point out that scattered around the world are quests that earn skill points, that take a wide variety of forms. Skill points are used to unlock your elite and utility skills. You also gain skill points as you level up, but you will have to hunt down the skill quests if you want to learn all the skills. Ultimately, this is what is going to sell the game. Buy the box, and you never have to give Arena net another cent if you don't want to. The base game is (I believe) $49.99. For an MMO of this scale, that's incredible and a huge selling point. It means you can pick it up and play the game at exactly the pace you want to for as long as you want. You never have to worry about getting your time in, you can play for an hour a month if you want to. It will quite possibly be the best value you find in any game ever. Well maybe not ever, but it will certainly be up there. Of course there will be a cash shop. At this point we basically know nothing about it, but based on what Arena net has done with their shop in GW1, there probably isn't really anything to worry about. As far as I know everything they sell is optional, cosmetic or what have you. The most controversial thing they sell is likely to be character slots, which is one of the only things we know will be on sale in the sequel. You have 4 (maybe 5, brain fart) slots by default and there are 8 classes. Ultimately though, even the cash shop is probably going to be quite reasonable. I have not heard of a single person who has played the original Guild Wars who has spent enough money on content and expansions to equate to a subscription. The closest I have personally heard was someone whose combined purchases averaged about $11 a month. The norm seems to be closer to about $3-5 a month. Again, keeping in mind that these all frill purchases.